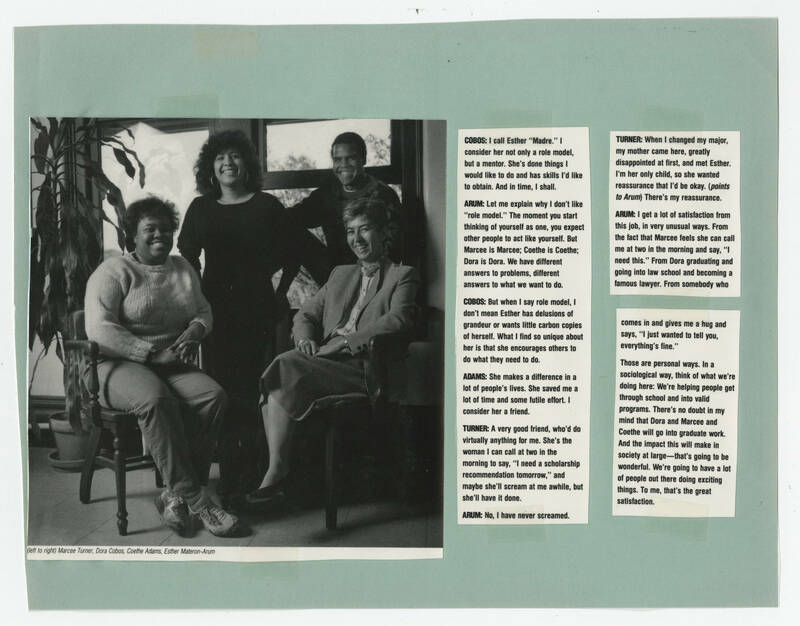 [[Photo caption]] [[italics]](left to right) Marcee Turner, Dora Cobos, Coethe Adams, Esther Materon-Arum[[end italics]] [[Article Text]] [[bold]]COBOS:[[end bold]] I call Esther "Madre." I consider her not only a role model but a mentor. She's done things I would like to do and has skills I'd like to obtain. And in time, I shall. [[bold]]ARUM:[[end bold]] Let me explain why I don't like "role model." The moment you start thinking of yourself as one, you expect other people to act like yourself. But Marcee is Marcee; Coethe is Coethe; Dora is Dora. We have different answers to problems, different answers to what we want to do. [[bold]]COBOS:[[end bold]] But when I say role model, I don't mean Esther has delusions of grandeur or wants little carbon copies of herself. What I find so unique about her is that she encourages other to do what they need to do. [[bold]]ADAMS:[[end bold]] She makes a difference in a lot of people's lives. She saved me a lot of time and some futile effort. I consider her a friend. [[bold]]TURNER:[[end bold]] A very good friend, who'd do virtually anything for me. She's the woman I can call at two in the morning to say, "I need a scholarship recommendation tomorrow," and maybe she'll scream at em awhile, but she'll have it done. [[bold]]ARUM:[[end bold]] No, I have never screamed. [[bold]]TURNER:[[end bold]] When I changed my major my mother came here, greatly disappointed at first, and met Esther. I'm her only child, so she wanted reassurance that I'd be okay. [[italics]](points to Arum)[[end italics]] There's my reassurance. [[bold]]ARUM:[[end bold]] I get a lot of satisfaction from this job, in very unusual ways. From the fact that Marcee feels she can call me at two int he morning and say, 'I need this." from Dora graduating and going into law school and becoming a famous lawyer. From somebody who comes in and gives me a hung and says, "I just wanted to tell you, everything's fine." Those are personal ways. In a sociological way, think of what we're doing here: We're helping people get through school and into valid programs. There's no doubt in my mind that Dora and Marcee and Coethe will go into graduate work. And the impact this will make in society at large--that's going to be wonderful.We're going to have a lot of people out there doing exciting things. To me, that's the great satisfaction.